As the year flies by, and we keep writing articles about everything packaging, we realized it was time to talk about packaging trends we have seen and heard about. In retail packaging a single idea can become a trend. This is why it is important to keep an eye of what other companies in your industry and similar industries are doing and evaluate your packaging strategy. There is absolutely nothing wrong in adapting strategies that have been proven successful to other companies. 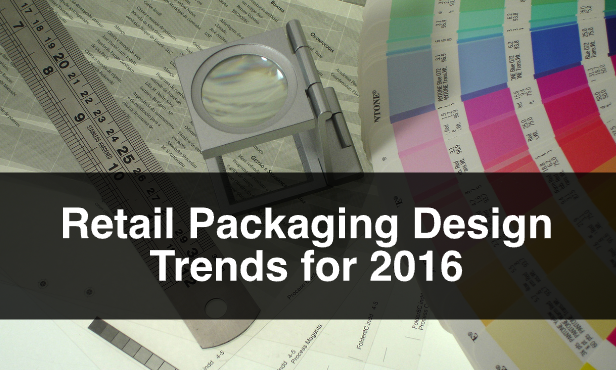 With that being said lets get to 3 retail packaging design trends we have noticed lately. Really successful packaging design conveys a message that is easy to read and easy to decipher. Simplicity ensures that there is no noise between the message being send and the person receiving it. This does not mean that simplifying your packaging should lack in creativity. On the contrary, when designing packaging the challenge is to make it as simple to read and understand, and as attractive to the consumer as possible. Remember, you want to communicate the benefits of the products to the consumer. Sometimes it is a matter of simplifying the design, and a lot of the time it is important to understand that the message needs to be simplified as well. Here is an example of a simple message that it is easy to read and understand, and it explains the benefits of what the consumer is purchasing. A huge design trend for 2016 is the use of repetitive geometrical shapes in a pattern. This is a trend that spreads across all areas of design, from graphic design, to websites and clothing. Patterns and shapes tend to express simplicity and approachability. A lot of successful packaging design that use patterns, tend to use it with really basic shapes and a limited colour pallets. Think circles, squares and triangles in contrasting colours. The idea here is to show that you understand how overwhelmed consumers are. In other trends posts we have written in the past, we have mentioned the importance of sustainability as a trend. We have included it here to emphasize how important this is. There is a lot of consumer pressure on companies to ensure that their products cause the smallest impact on the environment. Using materials that are easy to dispose of, informing the consumer how to properly dispose of the material, using materials that are recyclable and made of recycled materials, and having your packaging be reusable are a few ways we could make a big impact in being responsible with the environment. For more information, or questions about retail packaging please contact us. Also, sign up to our newsletter for more information, company updates, price specials, and more.